Do you think requiring bicyclists to have licenses, similar to automobile drivers (or a spot on our driver’s licenses similar to motorcyclists), would raise bicyclists’ stature in the eyes of law enforcement and the driving public? Would the inconvenience this would cause to cyclists be worth it to more clearly send the message to everyone else that we cyclists seriously want to be given the same respect as the automobile? 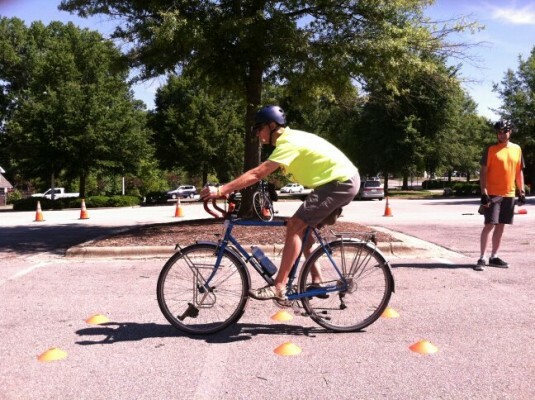 It has often been suggested, usually by non-bicyclists, that bicyclists should be required to pass a skills and knowledge test as a precondition for using our public roads. Anyone can see that inept and unlawful bicycling behavior is widespread here in the US, and studies show that moving violations by bicyclists contribute to about half of all car-bike crashes 1. 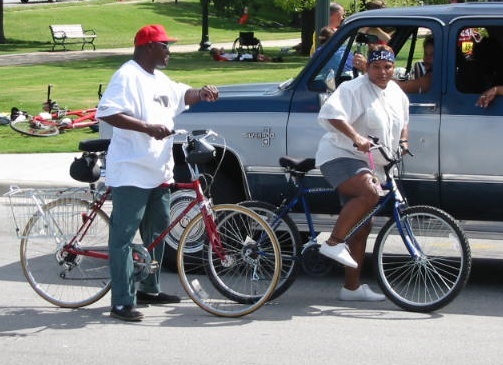 So why not license bicyclists like motorists to improve public safety? While many proponents of bicyclist licensing have motivations that are hostile toward bicycling, some others have a sincere interest in promoting safer bicycling, and so the question deserves a serious and reasoned response. No US state, and apparently no government on the planet, requires adults to pass a skills and knowledge test as a precondition for exercising the right to travel by bicycle on public roads. There are many reasons why this is so, ranging from beliefs about the appropriate role of government to cost-benefit considerations, regulatory program efficiency and social justice. Moving violations by motor vehicle operators pose a grave danger to members of the public, killing thousands of people each year in the US alone 2. By comparison, moving violations by bicyclists rarely injure anyone but the bicyclist. When bicyclists do injure people, the victims are usually pedestrians, and these bike-pedestrian collisions are more likely to happen when bicyclists operate on sidewalks, paths and other non-roadway facilities that bicyclist licensing advocates usually exclude from their proposed regulations. 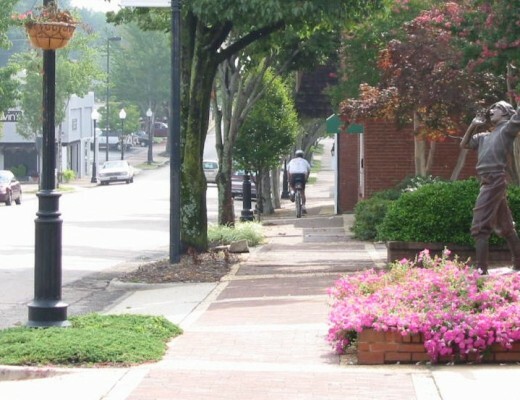 As a result, a licensing requirement for roadway use is unlikely to protect the safety of people, and may actually increase danger to pedestrians by encouraging more use of sidewalks by unlicensed bicyclists trying to avoid roadways, which studies have shown are the safer location for bicyclists to operate 3. Rather than having a credible goal of protecting the public from bicyclists, bicyclist licensing is usually touted as a way to protect bicyclists from themselves. By that reasoning, why not require people to pass a swimming skills and knowledge test and obtain a swimming license before being allowed to use public pools, beaches, and lakes? After all, more people drown per million hours of swimming than are killed per million hours of bicycling 4. But the public would reject such a swimming license scheme because it creates a high government-imposed barrier to entry into a relatively harmless activity where the risks are private rather than public. Instead, most people prefer to invest in swimming skill development voluntarily and gradually as their interest and participation in the activity grows. Another preferred strategy is to incorporate key swimming education components into public school programs. This is the practice for bicycling education in many countries, but here in the US there appears to be less appreciation of the safety benefits of bicyclist knowledge and skill than of swimming knowledge and skill. There are some “nanny” laws, such as seat belt use laws and helmet use laws, that have a fairly low cost of compliance for the individual, and yet these laws are often hotly debated. A bicyclist license regulation scheme, by comparison, would have a much higher cost of compliance, on par with the cost of motor vehicle driver licensing. Not only are there the government costs of developing and administering the testing and licensing program (costs that would presumably be passed on to the bicyclists), but also the time and cost of training. Motorists accept the costs of licensing because they appreciate the potential danger posed to them and other people by those motorists lacking important skills and knowledge. But for bicyclists, the threat posed to them by unskilled bicyclists is not compelling, especially if those bicyclists ride very little. An avid bicyclist who spends hundreds or thousands of dollars on bicycling equipment and invests hundreds of hours per year bicycling won’t be deterred from bicycling by a licensing scheme, but many occasional, casual bicyclists would be. Bicycle licensing costs would be especially burdensome for the lowest income people, many of whom cannot afford cars and depend on bicycling for basic travel. Then there are children, who make up a significant part of the current bicycling population. The result of a bicyclist licensing requirement would be an immediate reduction in bicycling participation by casual, low income, and young users. Such a reduction would have negative consequences for public health because the health benefits of bicycling greatly outweigh the health risks, even for unskilled participants. It would also have negative consequences for transportation accessibility, transportation system efficiency, and air quality. Many health and transportation stakeholders consider any policy change that makes bicycling more difficult to be a move in the wrong direction. Some bicyclist licensing advocates have claimed that police will not or cannot ticket bicyclists for moving violations unless bicyclists are licensed. In fact, police have little difficulty stopping and ticketing bicyclists for moving violations when they are motivated to do so, and have numerous ways to determine the identity of a person without a driver license. If for any reason police are unable to obtain satisfactory identifying information in the field, they can always bring the bicyclist to the police station (as happened recently to actor Alec Baldwin when he was stopped by NYPD for bicycling against traffic). The real reason why police rarely stop bicyclists for traffic violations is because police don’t consider it a priority, in large part because our society does not consider these violations to be a significant threat to the general public. In some places, mandatory bicycle registration programs have been employed as a means to identify the owners of bicycles. 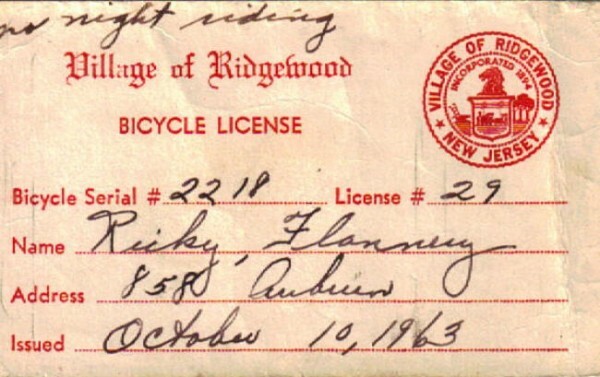 These programs imitated motor vehicle registration programs with the objective of reuniting owners with lost or stolen bicycles. In some cases they were also promoted as a way to help law enforcement officers hold bicyclists accountable for moving violations by facilitating revocation of bicycling privileges through seizure of the registration plate or even impoundment of the bicycle 5. Most of these mandatory bicycle registration schemes resulted in several unintended consequences. The first consequence was that the cost and inconvenience of registration deterred many occasional, child, low-income and multiple-bike-owning bicyclists from purchasing it; in many cities the vast majority of bicycle owners did not comply with the law. Another consequence was that police ended up spending less of their time and attention enforcing actual traffic laws and instead shifted their energy to enforcing the mandatory bicycle registration laws. Low compliance rates also meant that police could often assume that a bicycle was unregistered and use that suspicion to conduct pretextual stops and searches of most any bicyclist they wished 6. 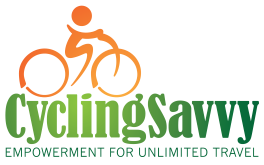 Lastly, the high cost of running bicycle registration programs compared to the price bicyclists were willing to pay meant that such programs were generally ineffective at revenue generation and often lost money. As a result, most localities that experimented with bicycle registration either eliminated the programs or made them voluntary in the wake of citizen complaints. Providing more resources for bicyclist education and training and increased police enforcement would be a more cost-effective approach for improving safety. Yet the weakest argument that has been levied in favor of bicyclist licensing is the idea that travel upon our public roads is a privilege that should come at a price and that the price should be as high for bicyclists as it is for motorists as a matter of “fairness” or for symbolic “legitimacy.” This argument attempts to turn centuries of road-rights law on its head. Since about the time of the Magna Carta, travel upon the public roads has been considered a basic human right to be protected from unnecessary interference. Early regulations such as medieval tolls were tolerated only when they were demonstrably fair and necessary for road construction and maintenance 8 9 10 11. 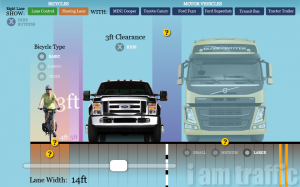 Motor vehicle-specific regulations, including licensing requirements, were developed in response to the new dangers motor vehicles posed to the general public. As the public costs of motoring dwarfed the public costs of human and animal powered modes, motorists became the focus of revenue collection for road funding. The few direct user fees that existed for nonmotorized travelers were generally abandoned as inefficient and impractical to collect compared to the alternatives, such as property taxes. The regulatory burden for all users, motorized or not, should be kept as low as the safety of travelers and the maintenance of the facility allows. Lower energy modes create much less public danger and pavement wear than higher energy modes, and so will have a lower regulatory burden. In a fair and free society, our traffic regulations are a means to an end rather than an end unto themselves. Incorporate bicycling education into public school curricula. Most nations that value bicyclist safety offer bicycling skills and knowledge programs in their schools. 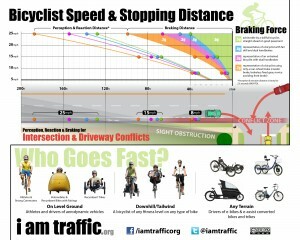 Over time, this provides all members of society (including children, adult bicyclists, motorists, police, politicians and traffic engineers) with a consistent concept of operations for effective traffic negotiation by bicycle instead of the misconceptions, myths and taboos that Americans hold about bicycling. 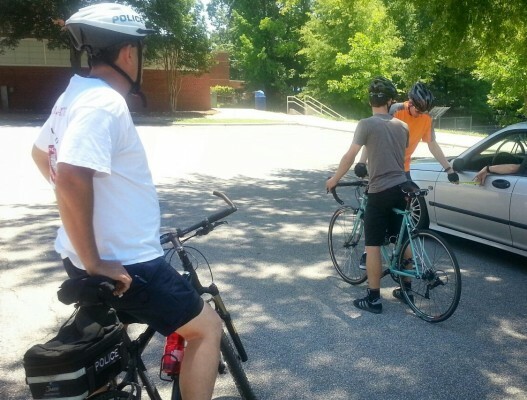 Educate motorists about bicyclists’ rights. The common myth that roads are for cars and not bikes adds fuel to another myth that the traffic laws are for cars and not bikes. Motorist harassment of bicyclists on roadways breeds contempt among some bicyclists for the driving culture including the normal rules of movement, and results in more unpredictable operation, such as sidewalk bicycling, red light running and wrong-way bicycling. Motorist education is sorely needed to address this social dysfunction and to provide a more hospitable environment for predictable and lawful bicycle driving. Train police in enforcement techniques that support safer bicycling. Most police are not adequately trained in traffic law as applied to bicycling or how to effectively prioritize enforcement actions to promote bicyclist safety. As a result, police often err by stopping bicyclists for bogus infractions, such as impeding traffic, while ignoring unlawful and truly hazardous violations, such as bicycling against traffic or bicycling at night without lights. Clear policies, priorities and procedures empower police to focus their actions on significant safety problems while promoting respect for the traffic laws. Invest resources in basic traffic law enforcement and related education. Enforcement campaigns that combine educational materials, advance publicity, verbal and written warnings, and targeted but fair issuance of citations can be highly effective at improving bicyclist and motorist compliance rates while protecting bicyclists’ access to their road system. Consistent enforcement maintains compliance and reduces long term crash rates. Using the arguments some make for licensing cyclists, one could also ask if pedestrians should be licensed. I made that comparison at a public meeting and saw lots of eyebrows raise in awareness. When other rights have been subjected (by legislation) to licensing requirements, the responsible law enforcement agencies have withheld those licenses and bragged about it. Licensure is a slippery slope whose efficacy at controlling the people who wish to exercise their rights has been repeatedly demonstrated. The problem with licensing cyclists is the same problem that we all face with licensing drivers; people obey all of the laws without a problem on the test, but once they are on their own, all of the rules go out of the window. Rolling stop signs, going through red lights when time is of the essence, passing people illegally (both cars passing cyclists and cyclists running through backed up traffic). As a cyclist, my life is more important to me than your being late to an appointment or work which is why I will take the lane when appropriate. If a car comes up behind me and I can safely move right for the car to pass, I will; but if the shoulder is full of rubbish (sand, leaves, glass, or rough road), I will stay in the lane until it is safe to move right. People see lateness as giving them a right to speed, but the late party should have left earlier and there is no excuse for not leaving earlier. They could have not hit the snooze button, they could have laid out their wardrobe the night before, they could have paid attention to the clock instead of the TV, and the list goes on. If there is an emergency, the appointment/boss will understand the lateness. As for licenses, they won’t work, but cycling education as part of the driver’s exam should be mandatory because all motorists have to take driver’s education and 99% of all cyclists have driver’s licenses so that covers that. As for the 1% of cyclists that don’t drive, cycling education could be made part of obtaining an ID card because they don’t have a driver’s license, but they are getting around somehow. Licensing cyclists is a concept often joined with that of registering bicycles, purportedly for safety purposes, but more likely for enforcement purposes. I agree with Steven’s points completely. I would suggest that not only should motorists be informed of cyclists’ rights, but that cyclists be informed of cyclists’ rights. This includes safely managing the lane and other related cycling safety practices. Too many people on bikes do not have proper understanding of safe operation. Included in my suggestion is also that of requiring a licensed motor vehicle operator to have taken some form of cycling safety course, including real-world operation of a bicycle. This would better prepare a driver to recognize the rights of a trained cyclist. The current society in the USA does not support any of the above suggestions. Cycling safety programs put on my local law enforcement and educational institutions too frequently enforce the wrong practices and should be overhauled or completely removed. Parents who lack an understanding of cycling safety are going to pass that lack on to their children. I’m pessimistic, but I don’t see anything changing in my lifetime, unless we get lucky enough to see twenty dollar a gallon gasoline or some viral infection strike down motor vehicle operations.